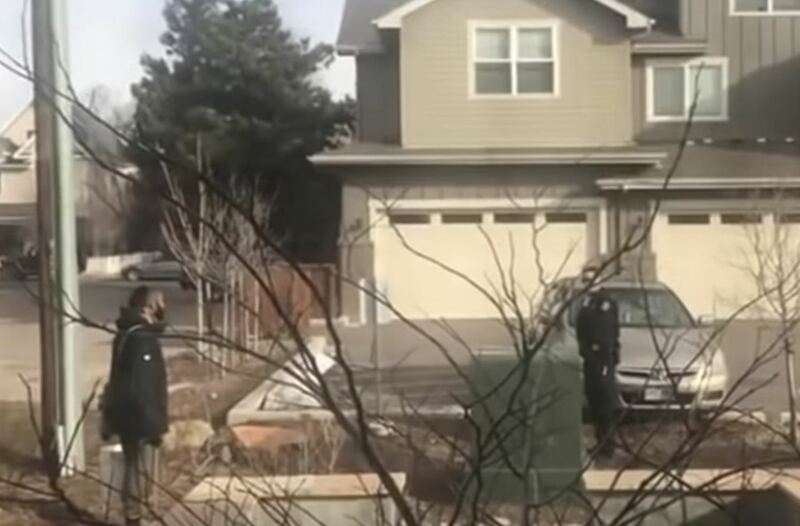 Heres video of a man in a Colorado suburb almost shot to death by a crew of AGWs for cleaning up his own backyard. The only reason the man is still breathing, probably, is because some neighbors stepped in to back the man up  and made it clear to the armed psychopaths that their actions were being recorded. The AGW ignores this; continues to escalate. More AGWs appear. A black SUV careens around the corner; an AGW comes out, takes up point on the opposite side, of the man. Note that none of them make the slightest effort to de-escalate, to ascertain whether, in fact, the man is in fact the owner of the house and is in fact just cleaning up his own yard. The first AGW thug unholsters his gun. Moves into a tactical position. The AGWs continue to bark at the man, drop your weapon! He is surrounded in a semicircle by eight AGWs ready to shoot first and ask questions later. Get off my property, he tells them. A kind of Mexican standoff ensues. The man refuses to show ID, reasonably, because he hasnt done anything illegal. The AGWs are perturbed, they commune. After about 10 minutes, they back off, reluctantly. Probably only because it has registered in their wee brains that they are being recorded and if they did gun down the man, they might actually face consequences. How to deal with AGW goons.